A revisionist new biography reintroducing readers to one of the most subversive figures in English history—the man who sought to reform a nation, dared to defy his king, and laid down his life to defend his sacred honor Becket’s life story has been often told but never so incisively reexamined and vividly rendered as it is in John Guy’s hands. 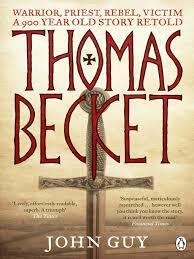 The son of middle-class Norman parents, Becket rose against all odds to become the second most powerful man in England. As King Henry II’s chancellor, Becket charmed potentates and popes, tamed overmighty barons, and even personally led knights into battle. After his royal patron elevated him to archbishop of Canterbury in 1162, however, Becket clashed with the King. Forced to choose between fealty to the crown and the values of his faith, he repeatedly challenged Henry’s authority to bring the church to heel. Drawing on the full panoply of medieval sources, Guy sheds new light on the relationship between the two men, separates truth from centuries of mythmaking, and casts doubt on the long-held assumption that the headstrong rivals were once close friends. He also provides the fullest accounting yet for Becket’s seemingly radical transformation from worldly bureaucrat to devout man of God. Here is a Becket seldom glimpsed in any previous biography, a man of many facets and faces: the skilled warrior as comfortable unhorsing an opponent in single combat as he was negotiating terms of surrender; the canny diplomat “with the appetite of a wolf” who unexpectedly became the spiritual paragon of the English church; and the ascetic rebel who waged a high-stakes contest of wills with one of the most volcanic monarchs of the Middle Ages. Driven into exile, derided by his enemies as an ungrateful upstart, Becket returned to Canterbury in the unlikeliest guise of all: as an avenging angel of God, wielding his power of excommunication like a sword. It is this last apparition, the one for which history remembers him best, that will lead to his martyrdom at the hands of the king’s minions—a grisly episode that Guy recounts in chilling and dramatic detail. An uncommonly intimate portrait of one of the medieval world’s most magnetic figures, Thomas Becket breathes new life into its subject—cementing for all time his place as an enduring icon of resistance to the abuse of power. The Archbishop Thomas Becket speaks fatal words before he is martyred in T. S. Eliot’s best-known drama, based on the murder of the Archbishop of Canterbury in 1170. Praised for its poetically masterful handling of issues of faith, politics, and the common good, T. S. Eliot’s play bolstered his reputation as the most significant poet of his time. Murder in the Cathedral revives the awesome 1953 Old Vic performance of Eliot’s play about the power struggle between Henry II and Thomas Becket, originally performed in the cathedral itself at the 1935 Canterbury Festival. Composed in the immediate aftermath of Becket’s murder in 1170, and based, in part, on oral testimony gathered at Canterbury and from Becket’s sister, Guernes de Pont-Sainte-Maxence’s 6180-line narrative poem is the earliest Life of Becket to appear in the French vernacular. Its account of Becket’s life and martyrdom, though heavily biased in favour of its saintly protagonist and the cause he embraced, is informative as well as vigorously polemical. It offers a viewpoint different from that of contemporary Latin historians in that it was written to be listened to by laymen and women. It was also recited at the saint’s tomb at Canterbury, and provides therefore a picture of events that would have reached a contemporary French-speaking public avid for first-hand knowledge of their new heroic martyr. Augustine’s mission to Britain in 597 was a pivotal event in English Christianity. Yet little is known about Augustine himself and even less about his leadership. Robin Mackintosh evaluates varied sources to produce a coherent narrative of Augustine’s mission, his journey through Merovingian France, and the outcomes for British Christianity. The newly-cleaned stained glass of Canterbury Cathedral in Kent, England is a revelation – the vibrant colour and breathtaking detail are newly visible to today’s visitors. The finest of this glass will be reproduced within a lavishly designed book to be enjoyed by tourists and general readers alike. In this book, Michael Michael has the pleasure of selecting the most beautiful and important pieces of glass on display at the Cathedral. His text sets these within the context of the biblical stories they depict. Communicating his passion for the glass and his understanding of its art and historical context, this book will appeal to non-specialists who are interested in the meanings behind single images and narrative sequences of glass. An additional chapter written by Sebastian Strobl outlines the fascinating history of changing methods of restoration and conservation, as well as the work carried out today by the Cathedral’s expert team.